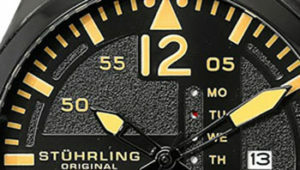 Stuhrling is a popular watch brand of American with a rich heritage that dates back to the 20th century. 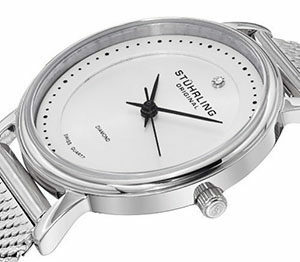 Stuhrling watches combine both modern technology and Swiss assembly traditions. Most of their watches are battery-operated and suitable for casual and formal affairs. Stuhrling’s headquarters is in Brooklyn, New York where they have been operating from since their inception. However, the watches themselves are made and assembled in foreign countries before being distributed all around the world. Are Stuhrling watches good? If you’re looking forward to buying a product of this company but cannot make up your mind what might be the best. 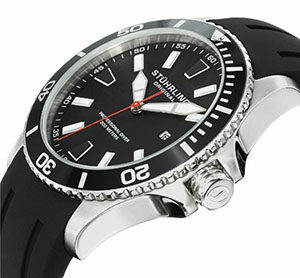 Just check out this Stuhrling watches review. Pros: 1. Quality time piece at an excellent price, classy, elegant and stylish. 2. Great accuracy with Swiss quartz movement. 3. Easy to read time and date. 4. Water-resistant to 200 m (660 ft). Cons: 1. May be a little big for some people’s wrists. 2. Second hand doesn’t lineup correctly with the markers. 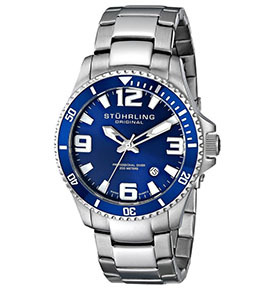 Stuhrling Men’s 395.33U16 watch has a solid case that measures 42mm in diameter. It is just the perfect size for men’s wrists. It has a deep blue face with silver numberings that radiate in the background, plus hour and minute hands also glow nicely. Also available is a stainless-steel triple row chain bracelet connecting to a round shaped casing, and bottom decorated backcase. This compliments its blue dial that comes complete with luminous Arabic markers. The wristwear has Swiss quartz movement and displays analog. It has been designed to meet a 7-point accuracy criteria, which is considered highest in its category. There’s also a date window at bottom right and a protective Krysterna crystal dial screen that’s very visible. Pros: 1. Sleek, stylish and easy to clean. 2. It’s tough and can be used both in freshwater and salty ocean water. 3. The band is adjustable to various wrist sizes. 4. Water resistant to 200 m (660 ft). Cons: 1. The band might become more flexible over time with wear. 2. Date window is too small to see. 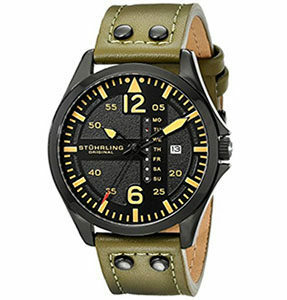 Stuhrling Men’s 706.01 watch is a beautifully constructed wristwatch for men. It features a unidirectional gear-edge bezel as well as black dial with fluorescent indices and square date window. It has a moderately sized face that’s eye catching, plus bright red second hand which compliments other indices bearing crisp white details. The round casing is made from stainless steel and measures 43 mm. And there’s a shatter proof Krysterna crystal dial window that adds to the timepiece’s durability. Also available is a silicone rubber band. But it doesn’t have a rubbery look, this ultimately gives the watch a multifunctional purpose. So it can serve both as a casual sportswear and formal accessory. It has a Japanese quartz movement with analog display and is water resistant to 200 m (660 ft). You can use it outdoors for river fishing or kayaking without worrying about the watch going off. In a word, Stuhrling 706.01 is great, high quality, for very reasonable price. If you’re looking to add an everyday sport watch to your collection you couldn’t do better than. Furthermore, the packaging is high end coming in a large orange box with the watch nicely displayed inside. Whether you’re getting one for yourself or as a gift to someone special, this watch would definitely make a great present. Pros: 1. Nice looking watch with a rugged casual appeal. 2. Easy to read time and accurate. 3. Unique color scheme with subtle military style design. 4. Durable case with a scratch resistant crystal face. 5. Water resistant to 100 m (330 ft). Cons: 1. The band quality could have been better. 2. Day and date feature can sometimes be problematic. 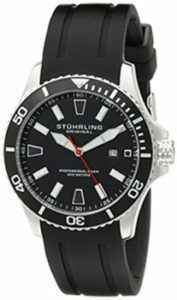 Stuhrling Men’s 699.03 watch is a black ion-plated timepiece that features a textured dial plate. Some people say that the dial looks more like an instrument in a plane cockpit. It’s light in weight and snugly on the wrist. Additionally, the face is moderately sized with the numbers being lucid clear even in darkness. The watch’s bezel measures 43 mm which is perfect size for an average wrist measuring around 7-inches. There is a date window at 3 o’clock position and it is very easy to read. It brings the highly appraised Japanese quartz movement. And the crystal dial window protects the analog display from scratches or any other damage. This watch is riveted in a sturdy yet soft olive leather band that contrasts nicely with the black aviator dial, featuring yellow markings. It looks great plus is very comfortable and strikes a perfect balance between classic office wear and a outdoors accessory. It’s suitable for light water activities like snorkeling or swimming, but not scuba diving. The product is packaged in a hard double-boxed cardboard sleeve that’s reinforced with a heavier padded casing inside. When opening it for the first time, you’ll notice everything is of high quality. In summary, Stuhrling 699.03 is an innovative wristwatch with a spectacular design and comes packaged in a beautiful presentation box. If you want an unique watch for all needs and purposes, this would be the way to go. Pros: 1. Looks elegant, professional, and still a little bit of bling. 2. Come with additional strap easily replaceable. 3. This is the type of wrist wear that can be worn in all occasions whether formal or informal. 4. Water-resistant up to depths of 50 meters. Cons: 1. Watch band doesn’t have a safety spring. 2. May be too large for some people’s wrists. 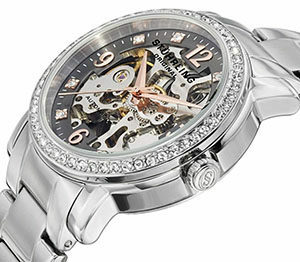 Stuhrling Women’s 388L2.SET.03 watch has a stainless steel gold-plated bezel, and a central halo consisting of Swarovski crystals. The transparent face and beautifully arranged gemstones at the center all add to its feminine charm. And the crystal dial window protects the analog display from scratches or any other damage. It also comes with a custom black strap that’s easy to change with a white one. Apart from being transferable, the mechanism used for holding these straps together is also very strong. Similarly, the technology aspect of this wrist wear is outstanding. It runs on Swiss quartz movement that helps keep perfect time. Furthermore, this watch is water resistant to 50 m (165 ft), it is suitable for short periods of recreational swimming. 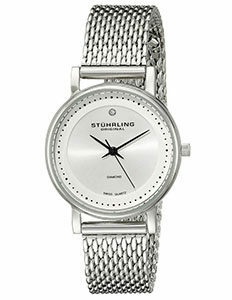 Stuhrling is highly recommended for new watch owners who want something simple and stunning to get by with each day. 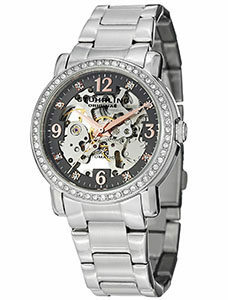 For women looking to make a fashion statement, this watch would do just that. It’s minimalistic in design making the wearer look more independent. With it you’ll rarely go out without somebody noticing what’s on your arm. As a man, you can get one for your girlfriend as a gift or anniversary present. It arrives in an elegant package that she will appreciate. In one word, this watch can be described as nice, classy and worth the attention. Pros: 1. Clean and simple design. 2. Cassic and elegant with affordable price. 3. Lightweight with no extra burden on the user’s hand. 4. The stem is easy to pull out for adjusting time or changing batteries. 5. Water-resistant up to depths of 50 meters. Cons: 1. A little difficult to readjust the wristband and when readjusted, the clasp didn't fasten. 2. Not for diving or snorkeling. 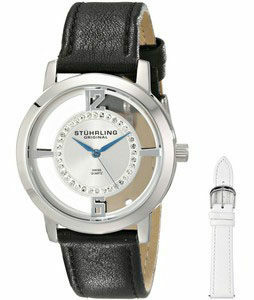 Stuhrling Women’s 734LM.01 watch is silver in color and made of stainless steel. It has a rounded bezel with sunray dial that’s numberless plus a small diamond at the 12 o’clock mark. The watch has Swiss quartz movement with analog display, as well as 29mm stainless casing and Krysterna crystal dial window. Furthermore, this wrist wear is water-resistant up to 165ft underwater. Making it suitable for short sessions of leisure swimming, but not snorkeling or diving. Another important factor is that this watch has a plastic latch interior which holds the knob perfectly into place. This helps prevent the battery from being consumed unnecessarily. To initiate movement, simply lift up the clasp and push on the handle. While this aspect may seem simple to some people it’s still very convenient. It eliminates the strain of having to change batteries by first removing the back case manually. Additionally, the band doesn’t have any holes or links meaning it can be adjusted to match any size of wrists. It uses a 2-way clasp system that guarantees the watch stays securely on the wrist at all times. This watch is also durable and you can use it for many years without encountering any major technical issues. Generally, it can be concluded that Stuhrling 734LM.01 is simple yet elegant in design and with a taste that’s very individual. If you are looking such a watch, this one can be one of your choices. Pros: 1. Has a dense solid frame that exudes confidence, sturdy and elegant. 2. Automatic movement makes it never needs batteries. 3. Has an attractive see-through skeleton interior, very unique. 4. Water resistant to 165 feet (50 M). Cons: 1. May be a little big for some people. 2. Slightly difficult to quickly check the time. 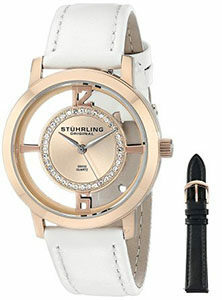 Stuhrling Women’s 531L.111154 is a beautiful watch with rose gold details on the number indicators. The case is made of stainless steel with a crystal filled bezel, triple row link bracelet and a transparent mechanical interior. Also available is a fold-over clasp with dual push-button safety closures, Dauphine hands, Arabic and quartz hour indicators. It is powered by an automatic movement with analog display, silently running on the user’s wrist motion. Since the watch is self-winding you don’t need to replace batteries for it to work. It is very convenient since you won’t have to worry about the cell running out of energy. But the watch should be worn for at least 8 hours per day, or else it would work slower than normal or even stop briefly. All the inner workings of this timepiece are visible meaning you can easily identify technical issues well in advance. The watch has a deep steel gray color that’s attractive to look at. The protective Krysterna crystal dial frame offers extra protection in case of a fall or hit. This watch is also water resistant up to 165ft, making it suitable for short periods of recreational swimming. In conclusion, Stuhrling 531L.111154 is a beautiful and unique watch. It’s sturdy and elegant. But always remember to wind up the dial properly before wearing so it can pick up motion. When handled correctly this watch would be a amazing timepiece that’s also very dependable. 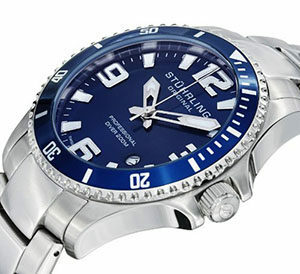 Stuhrling is a renowned brand popular for producing some of the most exquisite timepieces in the market today. For years they’ve dedicated themselves to making beautiful watches with a rich Swiss heritage. They offer wide range of high end watches from which you can choose as per your preferences. In this stuhrling watches review, all the six watches show that indeed the company remains committed to its original mission of preserving high production standards. These timepieces are a perfect blend of style, fashion and high quality craftsmanship. Each model depicts a personal story with extraordinary style that customers from different cultural backgrounds will really like. And these watches will make great gifts for those who want to present them to their girlfriends or wives for anniversary.